Hydraulic rowing machines are known for being compact and affordable and have become especially popular with folks with limited workout space. Finding the best models, though, can be a little tricky because there are so many similar looking products to choose from. But as they say, the devil is in the details- knowing what to look for makes all the difference. This guide is here to show you what to expect from these tiny titans as well as what you should be looking for when making a purchase. I’ve also provided a quick review of what I consider to be the best hydraulic rowing machines currently available. What Is A Hydraulic Rowing Machine? I want to start from the beginning to make sure everyone’s on the same page. It’s probably a good idea to make sure we’re all talking about the same thing here before we get ahead of ourselves. A hydraulic rowing machine gets its name from the mechanism it uses to provide resistance. In this case, a hydraulic cylinder is used, hence the name. The other types of rowing machines are also named based on the type of resistance they use. These consist of air, magnetic, and water rowers (which I’ll be referring to collectively as “full size rowers” from now on). For more info on full size rowers, check out my rowing machine buyer’s guide. The name may sound high-tech, but it really isn’t. These are actually the lowest-tech rowing machines of the bunch. The hydraulic system simply consists of a cylinder with oil/air in it and a piston that slides through it. The piston has an attachment to the arms of the rower, so that as you row, the piston moves in and out of the cylinder. Resistance is created as the piston moves through the oil inside. The hydraulic system is used to create the resistance for all of these rowers, but there are differences between the resistance systems themselves. Hydraulic rowers can have a single piston or dual pistons. In a single piston set up, both arms have a joint attachment to the piston- that is, both arms work together and push against the resistance created by one hydraulic piston. Machines that have two hydraulic pistons are preferred because each arm is attached to its own hydraulic piston. With this setup, you theoretically get more resistance because each arm is working against its own piston. Also, each piston has to theoretically work half as hard to keep up during the workout- something that should allow each to last longer. Some hydraulic rowers have adjustable resistance, some don’t. Having the ability to play with the amount of resistance is a good thing in my book because you can increase the load as you get stronger. It’s faster and easier to simply turn the dial to change your resistance. There are also complaints about machines that use the adjustable piston attachment method because sometimes it slides down as you exercise, decreasing the resistance level. It can also be hard to make sure the resistance is equal on both arms in these cases. Something else you should know- with all hydraulic rowers, as you row for extended periods, the oil in the cylinder heats up, making it less viscous. As this happens, the resistance level drops. With adjustable resistance pistons, you will probably have to gradually increase the resistance level in order to maintain the same resistance throughout your workout. The piston and get really hot too, so try to avoid touching it after a long workout. Single, fixed arm- this is the simplest set up, you just have a horizontal bar with handles on it. You pull on the bar with both hands together in a fixed pathway. These machines are cheaper, but you don’t get to adjust your rowing pattern. Dual, fixed arms- in these cases, you have 2 separate arms, but the pathway you row in is fixed. This is a good choice for people who don’t want to change the width or pathway of their rowing stroke. A lot of the nicer hydraulic rowers are offering open motion arms now because it gives you the most control- if you don’t like the wider arc of movement, you can still row with a more standard motion. The seats on these rowers are pretty standard and they usually aren’t particularly comfortable. That said, even the high-end air rowers don’t have comfortable seats if you ask me. What I wanted to point out here is that with hydraulic rowers, the seat can be fixed or sliding. All of the rowers I picked here have sliding seats because they are typically preferred- they get your legs more involved (which burns more calories) and they offer a more comfortable workout. The monitors on these rowing machines are very basic. Most of them have small screens that simply track the usual metrics: distance, calories, time, and row count. Some of the nicer hydraulic rowers have monitors that are compatible with heart rate monitors, but most don’t. Don’t expect any fancy features or workout programs on these monitors, not gonna happen. These rowing machines are popular for their small size, but they’re also really popular because of how affordable most of them are. These are the most budget friendly rowing machines of the bunch, probably because of their small size and simple resistance systems. A lot of hydraulic rowers can be found in the $100 – $200 range with the highest-end machines in the $300 – $600 range. Compare this to full size rowers, where the highest-end options cost in the $900 – $1200 range and you can see why so many people opt for hydraulic rowers. These rowers are compact, making them a smart choice for apartments and small homes. The average hydraulic rower is only 4-5 ft long and 2-3 ft wide (some of the rowers with open motion arms may need a little more elbow room due to the wider rowing arc). Compare this to the average full size rower that is 7-8 ft long and the difference is obvious. Hydraulic rowers are pretty light weight too, with most of them weighing 30-60 lb. The above info fills you in on the broad strokes of what you should expect from these rowers. In order to find the best hydraulic rower for yourself, you need to examine and compare the fine details. First and foremost, the first thing you’re probably going to look at is price. This is a necessary evil because in the end, you need to make sure you find something you can afford. A rower can check off all the items on your list, but if it’s out of your budget, it’s out of your budget. Once you have your budget in mind, I recommend you decide on whether you’d like a single or dual piston rower. I prefer dual systems, but it’s something you need to decide on. You also need to decide whether you want fixed or open motion arms. This feature doesn’t necessarily affect the price that much, although the most affordable rowers usually have a fixed arm. Weight capacity- this is a big one for me, because it gives us an objective measure for how sturdy a machine is. Larger is always better in my book. When it comes to hydraulics, the weight limits are lower because these machines are so small. Most weight capacities are around 250 lb, although some rowers on this list surpass that. Warranty- definitely something that needs to be considered when comparing rowers. This is your insurance plan on your rowing machine and longer is always preferred. Warranty is usually directly related to price- the more expensive machines have longer warranties. Rower warranties are split up into frame and parts. Frame warranties can be anywhere from a few years to lifetime, parts warranties can be anywhere from 90 days to 3 years. Kettler is a German company that produces fitness equipment as well as some furniture and toys. The name may not be as recognizable as some of the other brands on this list, but their Kadett Rowing Machine definitely earns the top spot. A quick glance at their specs will reveal why. This rower comes with dual pistons, each with 12 levels of adjustable resistance. You can rapidly change this resistance on this machine by simply turning a dial. This gives you a lot of control over the intensity of your workouts and with 2 pistons, the Kettler is capable of providing enough resistance to challenge users of all fitness levels. The open-motion arms give you the ability to customize the feel of your row during your workouts. They are designed to provide a wider arc motion that mimics the feel of rowing with oars, but if you want to row with a more narrow motion you can. The perk is that it’s completely up to you. The feature that ensures the Kadett as the top hydraulic rower is the warranty. A lifetime warranty on a hydraulic rower frame is almost unheard of. This great warranty is an indicator of the quality materials and construction Kettler puts into this rowing machine. Three years on parts is also impressive for these rowers. The quality of build also becomes evident when we see that the Kadett has a max user weight limit of 285 lb. This is higher than most in this class, giving this rower the ability to accommodate bigger users. Put it all together and you have the best hydraulic rower around. The Kadett is also one of the most expensive hydraulic rowers, but if you ask me, the extra cost is warranted given the lifetime warranty and dual adjustable resistance pistons. Kettler’s other hydraulic rower landed the #2 spot because it offers the same quality construction, but with a few downgraded features. If you’re looking for a rower that is built to last, but the Kadett is a little out of your price range, the Favorit might just be what the doctor ordered. At first glance, you might not notice much difference between the Favorit’s and the Kadett’s stats, but there are a couple of key differences. The Favorit also comes with dual pistons that are adjustable. But the resistance on this rower is adjusted by moving the piston attachment on the arm. The result is similar, but it takes a little longer and it’s a little more cumbersome than being able to turn a dial. The other biggest difference are the arms. The Favorit comes with fixed motion arms that provide a more traditional rowing feel. There’s a little play with the width of your grip here, but your rowing motion is pretty set. If you aren’t worried about being able to row with the wider motion, this probably won’t bother you. Kettler offers the same great warranty on this rower and the weight limit is identical. The only other difference is the price- the Favorit costs about $200 less than the Kadett. If you’re cool with the resistance system and the fixed arms, the Favorit is a great buy. It’s another well-built hydraulic rower designed to last for years. EFITMENT is the fitness equipment brand for Zoovaa, an importing company that provides a little bit of everything at budget prices. Their rowing machine made the list for its combination of impressive features and low price. There is one feature in particular that really sets this rower apart, can you spot it? In case you didn’t, I was referring to the weight capacity. This is the highest weight limit I’ve seen on any hydraulic rowing machine, and by far. At 350 lb, this little rower can accommodate folks that may have once thought their plan to own a rower was impossible. This rower also has a longer slide rail than most, making it a nice choice for the taller people out there. The EFITMENT rowing machine has a single piston resistance system that is adjustable with a dial. Something to consider here is that the piston really heats up during use and shouldn’t be used for longer than 20 minutes at a time (according to EFITMENT). The open motions arms provide that wider arc of motion, similar to the Kadett. Users agree the arms work smoothly and having the ability to adjust your motion comes in handy. Both arms attach to the single piston which is under the frame. This machine is significantly less expensive than the two Kettler rowers above. With the lower price, we see a big difference in warranty. That said, for a rower well under $200, a 3-year frame warranty is pretty decent. There’s no getting around it, 90 days on parts is short, but this is a very affordable rowing machine. Overall, the EFITMENT Total Motion Rowing Machine is a good choice for the bigger and taller folks looking for a compact rower. It’s built tough and the adjustable resistance works well, just be careful as that piston starts to heat up. Stamina is a pretty well known fitness brand, they’ve been providing affordable fitness equipment for 30 years or so. They offer several hydraulic rowers, but the 1215 is probably their best buy in terms of features and asking price. The Stamina 1215 comes with a dual piston resistance system, which is a nice perk right off the bat. The resistance is adjustable by changing the position of the piston attachment on the arm. There are 5 different settings on each arm, giving you 5 different resistance levels. This is fewer than most, but still enough to give you some options with your exercise intensity. The arms are free motion, so you can row with a more narrow, traditional form or opt for the wider arc like rowing a boat on water. The operation is smooth and the foam padded handles keep your hands comfy during your workouts. The warranty on this rower is identical to the EFITMENT rower above. Its a decent warranty, especially on the EFITMENT. The 1215 costs about a $100 more than the EFITMENT, so it would be nice to see a little longer on the warranty, but that extra cost is warranted with the addition of the second piston. The weight limit on this machine is standard for rowers this size. Not nearly as impressive as the weight limit on the previous rowing machine, but most aren’t. Overall, the 1215 is a quality mid-range hydraulic rower with some impressive stats. For the price, it’s one of the nicest dual piston rowers around. Sunny Health & Fitness (SHF) has become one of my favorite budget fitness equipment brands because they’ve mastered the art of making affordable equipment that works. SHF offers a little bit of everything fitness related and all of their products tend to have two things in common: they’re usually the most affordable and the most highly rated in their category. The SF-RW1205 (1205) is no different. It’s quite possibly the cheapest rowing machine you’ll ever find. Given the price, the specs are surprisingly impressive. It’s surprising (to me anyway) to see an adjustable piston on a rowing machine well under $100. There is only one piston on the 1205, but it is adjustable by using the dial. There are 12 levels of resistance to help you fine tune and progress your intensity as you get stronger and fitter. This is the only rower on this list with a single, fixed arm. It’s really just a horizontal bar with two handles. The fixed pattern doesn’t allow you any freedom in terms of your rowing pattern, but it’s also really simple to use. There’s no learning curve here, you sit on it and off you go. The warranty offered by SHF on the 1205 is one of its most redeeming qualities. For a rowing machine in this price range, its not uncommon to see a 1 year frame warranty or less. The 6 month parts warranty actually beats out the 2 previous rowers on this list. Long story short- SHF is willing to back up their products, even their most affordable ones. You’ll also notice that the weight limit on this rower is significantly lower than the other machines discussed so far. At only 220 lb, the 1205 is designed with smaller users in mind. Larger folks will have to go with a different rower. Speaking of small, the 1205 only weighs about 20 lb fully assembled. If you’re on a really tight budget and you fit the size requirements, the SHF 1205 is a good buy. This little rower isn’t designed for strenuous workouts though- if you’re a strong rower you may want to consider a more robust machine. Rounding out our list is another Stamina rowing machine. The 1050 is one of their most affordable (and most popular) models. With an asking price at just around $100, Stamina still offers an adjustable resistance piston and dual open motion arms. The single piston on the 1050 is adjusted by turning a dial. It wouldn’t be too surprising if this piston wasn’t adjustable at all at this price range, but kudos to Stamina for offering us this luxury. There are 12 different resistance levels available. This is another open motion rower with a wider rowing arc for those who wish to take advantage. Like the other rowers that offer this feature, it’s optional. You can row with a narrow motion if you prefer, or change it up throughout your workout. The warranty on the 1050 is more of what we would expect from rowers in this price range- very short. This isn’t as much a ding on this rower as it is a praise for the SHF 1205 rower above. 1 year on the frame is pretty normal for a $100 rower. As is the weight limit. Overall, the Stamina Body Trac Glider is a nice choice for folks on a tight budget looking for open motion arms. The warranty is shorter, but the weight limit is a little higher than the SHF model. 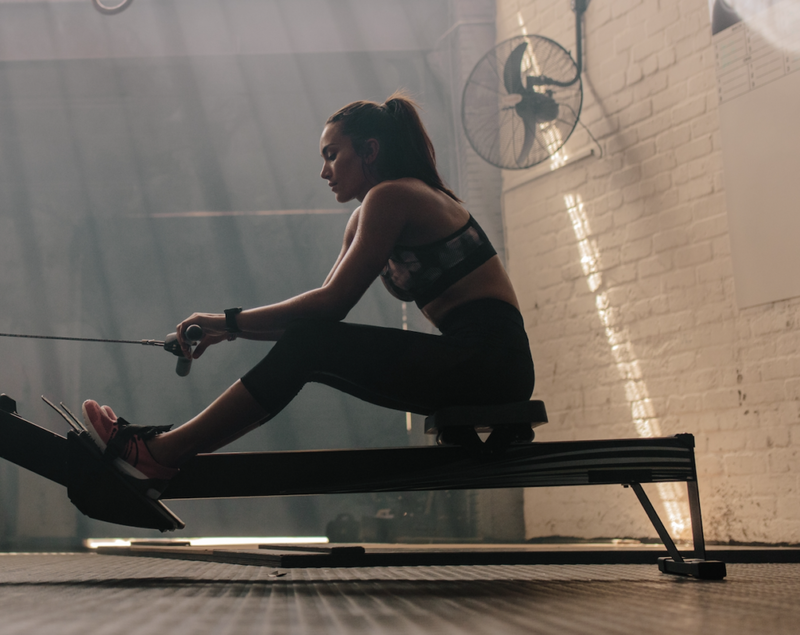 Hydraulic rowing machines have become a popular choice for home gyms because they are more affordable and significantly more compact than their full size counterparts. At roughly half the size of a full size rower, these smaller machines can provide a lot of people the benefits of rowing who otherwise wouldn’t be able to do so in their homes due to lack of space. Essential features you should always consider include warranty and weight capacity. These are two of the most important aspects when comparing rowers because they are both direct measurements of quality. Last, but not least, you need to know your budget. Even though hydraulic rowers are the most affordable of all the rowing machines, they still come in a pretty wide price range. This is good news though, because regardless of what your budget is, you should be able to find a rower that fits in it.